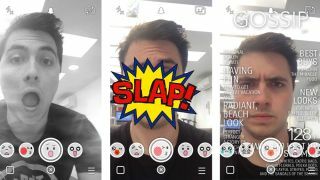 Snapchat was updated last week with a bunch of new AR effects that allowed you to pretend to be sick with rainbows or have a scary horror face – but now those have been taken down. A spokesperson for Snapchat told techradar, "A new Lens appears each day, with one dropping off when a new one is added." Don't get attached to the lenses then - at the moment the app features mustache man, gossip mag, angry face, slapped face, scared face, heart eyes and one that cracks the screen.